RIO DE JANEIRO, BRAZIL – Nearly three quarters of people living in Rio de Janeiro now feel safer than three years ago, according to a survey carried out by agency NBS, O Globo newspaper reports. The study’s results, released on Thursday, show 74 percent of those living in Rio now feel more secure after the process of installing UPPs (Police Pacification Units) began throughout the city’s favela communities. Rio's Security Secretary José Mariano Beltrame (pictured here in 2011) said the newly pacified areas need to focus on sustainability, photo by Rogério Santana/Imprensa RJ. The study questioned 500 people from Rio’s 34 administrative zones between the ages of fifteen and 75 years old. The results showed that 47 percent of locals have visited a “pacified” area – with nearly all saying the experience had been a positive one; but 8.1 percent of those questioned took a more pessimistic view of the new public security policy. 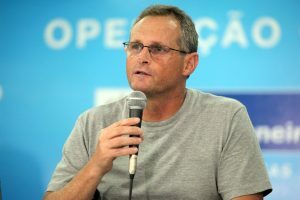 Rio’s Security Secretary José Mariano Beltrame – who was present at the survey’s unveiling in the Dona Marta favela – said that Cariocas “need to give sustainability and a meaning to these areas which were previously out of the formal control of the state and the city,” adding that the situation was clearly a work in progress. Cariocas were also asked about their feeling about the city’s preparations for the World Cup in 2014 and the Olympics in 2016: 45 percent were optimistic, but the same number had doubts about the upcoming major sporting events. The study is part of the Rio+Rio project, which aims to ease private enterprises into newly-pacified areas, thereby generating trade and encouraging locals to take a more proactive role in community businesses.